#1 Sun Lakes Realtor - Contact The Kolb Team for the BEST results! If you are looking for the #1 Sun Lakes Realtor, look no further! 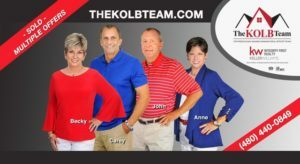 The Kolb Team is the #1 Sun Lakes Realtor (2018) in average days on market, sale to list price ratio and marketing online where we beat the competition hands down! If your dream is to own a home in Sun Lakes, Arizona you will need the #1 Sun Lakes Realtor to help you find or sell your home. If you are listing your home, days on market counts! Our average days on market for 2017 listings was 44. Among the top Sun Lakes Realtors, our closest competition was 55. Sale to list ratio is also important. In other words, how close to list price is the sale price. Our average is 99% and the closest, top producing realtors is only 97.5%. That means, on average, The Kolb Team sells your house for more money in less time. That’s money in your pocket! And, even better, 38% of our 2017 listings sold at or above asking price! Our closest competition was only 20%. We’ll tell you how we do that! Our Marketing earns us the #1 Sun Lakes Realtor position! Not only do our numbers speak volumes, but how we get there is equally important. The Kolb Team takes a listing to sell it. That requires careful consideration of coming up with an accurate price based on past sales and current inventory. When compared to the top real estate producers in Sun Lakes, we rank higher on page 1 of google than any others. And, that means your home is found by those searching online where 95% of consumers begin their search long before they contact a Realtor. 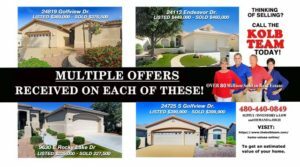 So, if you are looking to sell your Sun Lakes Arizona home, contact the #1 Sun Lakes Realtor here or call us at 480-440-0849. Becky and our marketing/SEO professional work tirelessly to market our listings and make sure they show up in the top of all Sun Lakes real estate searches. No other Sun Lakes Realtors invest in marketing your home like The Kolb Team. Give us a call and you will see the difference for yourself!